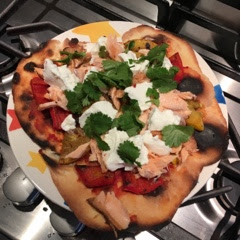 I made this lovely pizza one day for lunch during half term. It's a very quick way to get a pizza and tasty to boot. Put the salmon on a baking sheet and sprinkle the curry powder over the top. Bake in the oven for 12-15 mins until cooked. Flake. Put a little oil in a frying pan and fry the courgette and pepper until starting to soften. Spread the tomato paste over the flatbread and top with the salmon, courgette and peppers. Put into the oven for 5 mins to crisp up. Remove from the oven and top with the yoghurt and coriander. Serve.